LED bulbs that look like real flickering flames seem like the sort of thing that might be cheesy, but they’re actually awesome. I mean, I wouldn’t replace the overhead lights in my kitchen with them, but as accent lighting in outside lanterns, for example, they create an awesome effect that you’re going to love. They also look fantastic on a table in a base like this one. We’ve got two different sizes for you to check out. The first is the CPPSLEE E26 LED Flame Effect Light Bulb, which will fit in any normal socket, and then the KINDEEP E12 Candelabra LED Flame Light Bulb will fit smaller candelabra sockets. They’re both awesome, so it all depends on what type of fixture you have in mind. 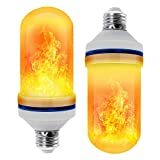 ♥CPPSLEE Flame Bulb type fit all your standard E26 hold-screws, fire down bulb fit your down hold-screws, fire up bulb fit the up hold-screws,both are safe,green energy saving and excellent heat dissipation. ♥SAFE & GREEN ENERGY SAVING:CPPSLEE flame lamp simulates natural flame, flickering flame light bulbs, no open flame, no UV and infrared radiation.The input voltage is AC90-265v and the power is 1.8W.Save 90% of electricity from traditional flame bulbs, save electricity and save money. ♥USAGE RECOMMENDATION: For better flame flickering effective , install bulb in a frosted glass shade, lantern, salt lamp etc. The Artificial Vivid Fire, Dynamic Moving Flame, Simulate Nature Fire Flicker Flame, wonderful Replacement of Traditional Gas Lantern. 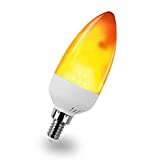 ♥APPLICATION: Great for Home decoration, Bedroom, Living Room, Bar, Hotel, Night Clubs, Outdoor Gardens, Restaurant, Coffee shop, Villas, Wedding decorations, Party, Church, Castle and more.Decorative bulb, warm flame colors decorate your space and give you a quiet, romantic and relaxing moment.